I feel obliged to mention that this beautiful peak crushed my spirits on my first day here on Monday… though really it was my own fault. I had plans to ski up to some broad meadows to photograph the peak at sunset, and a few hours before, I was parked at the pass, had my backpack packed, my boots on, and my skins on my skis. I was ready to go. But it was snowing pretty hard at that point, and I started to think pessimistic thoughts about the weather prospects, and after waiting a little while in the car, I succumbed to that pessimism and made the horrible decision to abort my mission and drive back to town. Why I didn’t just wait up there for an hour or so, I don’t know… but of course a few hours later the stormy clouds started miraculously lifting off the peaks. Seeing what was happening, I jumped back into the car and rushed back up to the pass. 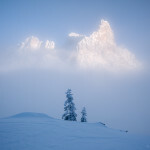 As I was reaching the pass, the clouds were swirling around Cimon della Pala, and the sunset light was painting the peak and the mist with striated bands of glorious orange light. It was one of the single most incredible mountain scenes I’ve witnessed in my life. I parked the car and again made a stupid decision… instead of just finding a decent spot to shoot as quickly as possible, I ran around looking for the best spot, eventually tromping through waist deep powder to a location that really wasn’t any better than from right off the road. At the exact moment when I had my tripod set up and my camera mounted, the clouds closed in, the peak was gone, and the incredible show was over. I had missed the shot of a lifetime. I have missed many great photo opportunities before, but none have stung so badly as this one. I was in shock and felt sick to my stomach. I wanted to turn back time… but no, I just plain and simply blew it and I will never get it back. It was a real-life photography nightmare. I took the photo above the next day, feeling a bit empty hearted. Anyhow, though I felt like renouncing photography for good on Monday, there’s nothing to do but keep at it, so on Tuesday I went on a ski tour to a perspective that I had wanted to get to on my first trip here, but couldn’t since I didn’t have a car that time. From this more distant perspective, Cimon della Pala stands straight and tall like a petrified rocket ship. Unfortunately the next storm rolled in sooner than expected, descended onto the peaks, and there was no sunset to be enjoyed. Of course this time I stayed up there past sunset anyways… I didn’t want to take any chances of making the same horrible mistake again! 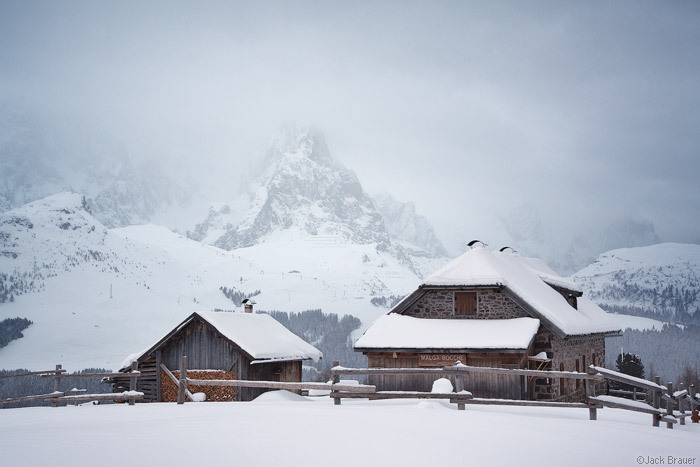 This is Malga Bocche, a backcountry cabin that commands one of the most stunning vistas in the world… when it’s visible. Today it is dumping snow… over a foot already. Perhaps I’ll get a chance for redemption when this storm clears! I will be there. By the way, I must send a hearty “thank you” to Daniela Anderson, and her mother, who have generously hooked me up with an apartment here in town for the week. Daniela grew up in San Martino and runs a Dolomiti travel agency called The Alpine Adventure Agency, and we have been friends for several years now. 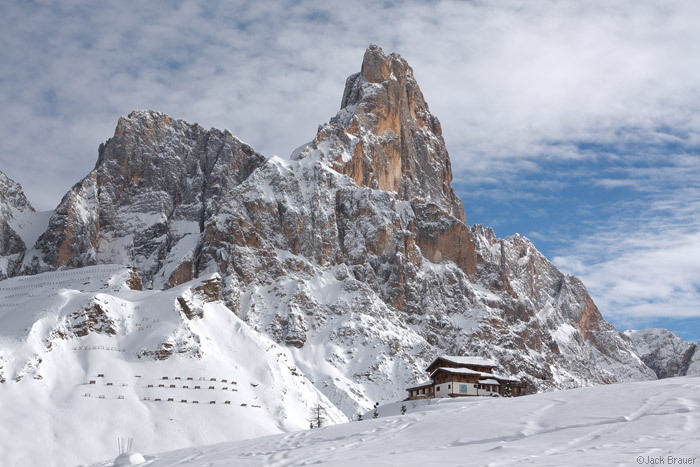 Though I have not participated in one of her tours yet, I know that I can heartily recommend them, due to her vast knowledge of the area and her obvious and infectious love of the Dolomites. Thank you Daniela! 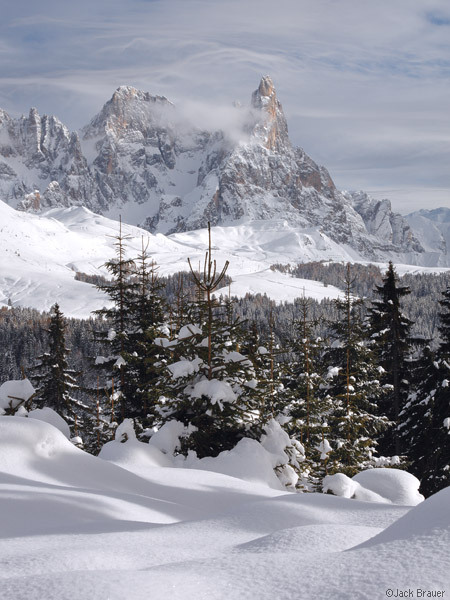 ← Previous: "Powder Binge in Cortina"
Damn, I feel your pain!! That’s the photographer’s curse: why can’t we be able to enjoy these moments without a camera??? Great stuff anyway, keep it up and I’m sure another better one will appear when you least expect it!! So it goes……after scoring the epic pow a few days ago you can’t complain. Thanks for sharing your adventures-the visual as well as the emotional ones. We get a first row seat to beautiful places in the world and in context with your descriptions they come even more to live. Still fine images, but I know the feeling all too well. Sometime I’ll tell you about the wolves playing in fog… Keep in mind that every single photographer has been crushed by a single detail missed, a single decision that went awry. Your hefty body of work is envied by many and you will be an even better photographer for this experience. Treat yourself to pizza melenzana, biere, and gelatto – let it go. Thanks for sharing the adventure! I’m photographing in Commerce City this afternoon, would you like to trade? Man, what a story! Man that’s a lot of snow! I sympathise deeply Jack. It never gets easier does it, no matter how many hero shots one always have. I know this situation all too well and it’s the stuff that just kills a photographer. I kick myself for days after missing a hero one in a million shot. Fortunately there’s always tomorrow, we get right back on the horse and hope again for one in a million light situations. Sometimes the reverse is true, outstanding light happens, I shoot away and get back and well…I didn’t quite capture it. That is almost as bad as not capturing anything at all but not quite. Beautiful. Would you adopt me so I can go along? Ahhhh….my friend…..like I mentioned in my email to you (the one where I was shaking my head and chuckling in sympathy) my beloved mountains are fickle ladies, and cloak themselves faster than you can blink! I am so moved that you rank the scene you saw up at Segantini among the most incredible you have witnessed. That “light” is unique to this area, and when it appears, even the locals come out to gaze in awe. Considering how many different mountains you have “touched” all around the world, that compliment coming from you makes me feel all the more blessed to have grown up among these special mountains. I truly hope that you will have a chance to witness the Enrosadira in all of its mesmerizing glory before you leave. Well…hopefully you will be able to get some good shots when it stops snowing. As for the one that got away…these mountains know how to hook you and keep you coming back – if you don’t get another shot this round, you’ll just have to come back to visit again! Thanks all for your comments! I knew you other photogs out there could sympathize. 🙂 Three days later and the sting is wearing off, or I should say that my memory of how awesome it was is wearing off. But I’m getting after it now… no luck with another awesome photo opp so far, but I’m certainly trying. What scenery…I can see why this is one of your most cherished places. What a bummer about the missed sunset. At least you described it with some pretty good imagery…nicely done! And as Daniela said – if you don’t get it this time around, you’d have extra motivation to come back again!